Videos are an integral component of many websites, including both Christian and non-Christian sites. They’re used to increase page views, time on site and user engagement. For churches, though, website videos can do much more than merely improve metrics. They offer a unique way to reach and help many different people–from shut-ins to pastors. Churches have long aired their Sunday services on radio and television to reach both Christians and non-Christians, and live streaming services online is a natural extension of these ministries. While many people may benefit from a video feed of your church’s services, shut-ins will particularly appreciate being able to watch a Sunday service. Streaming your church’s Sunday services on its website gives people who can’t physically be at church because of health problems or a lack of transportation a way to virtually attend and connect. Online videos provide a powerful way to proclaim the gospel to the lost in a setting they’re comfortable with. A well-done video will clearly present the core message of your church in a moving way. Whenever a non-Christian comes across your church’s website–which does happen–they’ll be able to watch and seriously consider your church’s message in a private setting. If your church has several pastors, a gospel-proclamation video is an excellent way to showcase each of your church’s ministers. Splice together highlights from each pastor’s sermons so that they flow together and present the core message of Jesus. This tactic will share the gospel, introduce people to all the pastors in your church and show interested visitors what your church’s preaching is like. Video testimonials provide concrete examples of how God has worked in people’s lives, which gives people who are currently suffering hope. Both Christians and non-Christians stand to benefit from hearing how God has rescued others from their troubles, especially if those people went through similar circumstances. With a handful of video testimonials, your church could give hope to people in all different situations. Just be sure to ask people who have had different struggles when curating testimonials, so your church’s website will showcase the many works God does and reach all kinds of people. One of the easiest ways to address the simple issues that keep neighbors from coming to your church is with an introductory video. In just a few minutes, your church can answer many of the questions that nearby residents who are considering coming to your church have. In a virtual tour, your church can show neighbors the nursery, what attendees wear, where the restrooms are and what worship is like. Issues like these might seem silly, but they can be serious stumbling blocks that keep people away on Sunday. Instructional videos can take your church’s Bible teaching from the pulpit into the home. A short video that people can watch during the week is perfect for introducing the next sermon, reinforcing the last sermon or even conducting a church-wide Bible study. Pull some highlights from the last sermon or have your pastor talk directly to the camera. Either way, a couple of minutes from your pastor will grow your church’s parishioners’ understanding of the Bible. Although many music videos might not be appropriate for airing in church, churches can benefit from creating their own music videos. Introducing your congregation to new songs will be easier if you first create a video of the song. A video lets members hear the tune, while also reinforcing the lyrics with visuals. Even if only a few people watch your church’s music videos, they will help other members of your congregation learn new songs more quickly on Sunday morning. A short video that explains the components of your church’s service will help anyone who has trouble following your Sunday service. Newcomers will obviously benefit from such a video, but even long-term members might learn something. In a low-church setting, a video summary of Sunday service will help people know what to expect. They’ll be able to follow along even if your church doesn’t hand out bulletins. In a high-church setting, explaining the components of your service will help people understand why your church’s service is structured the way it is. By showcasing what is going on in your church, promotional videos help pastors and other leaders who plan events. 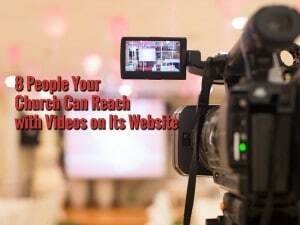 Getting the word out about events is an important aspect of running a church, and online promotional videos are a great way to disseminate pertinent details on upcoming happenings. Videos are great ways to tell people in your church about everything from youth group retreats and Bible studies to new sermon series and missions conferences. Adding videos to your church’s website will probably increase many of the site’s metrics, but this should not be the primary reason why your church includes videos on its website. Your church’s website should be a natural extension of its mission–which includes serving people. Videos give your church another way to reach and help people online. When your church approaches creating videos from this perspective, its website’s metrics will likely increase–but that’s just a sign that your church is effectively ministering to people.